Developed by Reggie Byrum. 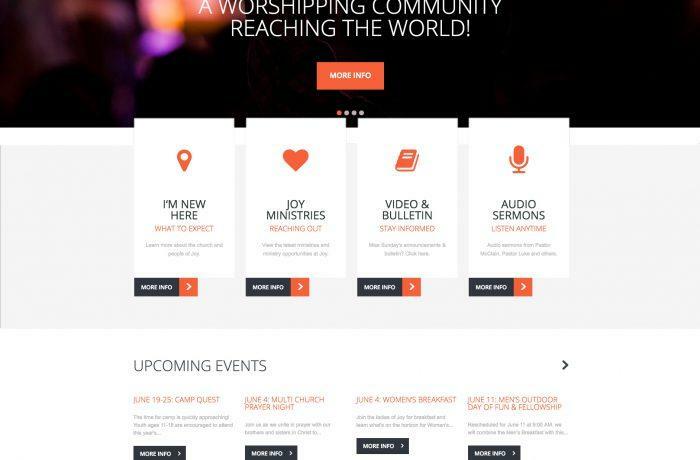 Pro Bono project for Reggie's home church, Joy Church needed an updated, responsive website for their non-denominational church located in Matthews, NC. After a Joomla development, the decision was made to move it to a more responsive WordPress platform that would be easier for any staff member to update. The result was a more modern site that was easier for the site visitor to navigate and find upcoming events and schedules. A sermon plug-in was loaded and is updated each week.